Saw an interesting talk yesterday from Karen Guillemin of the University of Oregon. I made a storification of the Twitter posts from the talk. See it at the end of this post. 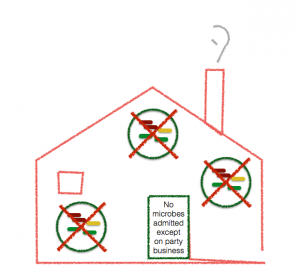 I note – I think there are some important lessons in the work on germ free animals that could be applied to studies of other microbiomes, including those of plants and those of buildings. For example, it might be interesting to mimic the work done in germ free animals with buildings. Can a germ free building be set up and then can on use introduction of specific microbes or microbial communities to those buildings to test various hypothesis about microbe functions in the built environment. I believe the answer is yes, but I have not seen much on this. Also – seems like the environments where germ free animals are raised could be used as such a model system. Furthermore, as I have pointed out before for other systems, it is clear that having a good culture collection of microbes found in association with Zebrafish has helped revolutionize the work on microbiomes of this fish. Clearly, for any ecosystem of interest, researchers should be making culture collections and characterizing them to use those organisms as part of understanding the systems. Hm, difficult to start from a germ-free building. All building substrates of plant origin enter the building carrying their own microbiome. One of the most common moulds growing in water-damaged buildings, Chaetomium globosum, is actually an endophyte, and you do not get rid of it just by sterilizing building surfaces. For the time being, wood and wood products are main components in buildings. Agree completely with the need of characterizing the building microbiome first (those microbes that CAN grow in buildings), and then trying to understand their ecology indoors. Yes, it is also difficult to get germ free animals. But once people have figured out how to get them to be germ free and keep them germ free, lots of interesting science has happened. It can be very hard to do. But I think it has been worth it. And I think it would be good to develop even simple, model, germ free built environments, for experimental studies. A building is not a living organism. It is more like Gaia, in the way that it reaches certain kind of equilibrium among their very specific living and non-living components. Say there is superior life out in the Univers. I am sure they can establish life and ecosystems again starting from a sterile planet Earth, but they would hardly get a replicate of Mother Earth as it is now. My idea here is NOT about making something natural or normal. It is copying the studies of animal microbiomes where creating completely ludicrous, artificial, germ free animals with complex methods can allow one to do very useful experiments.